“No problem” Javia chucked from the driving seat as we finally made it back to the car. The soft, cool leather seats and the sudden blast of refreshingly cold air were a welcome comfort. We had returned to the car after one of the best mornings of our lives in Ocho Rios, albeit about an hour and a half later than expected. Nothing was a problem for Javia. The goal of the day had been to see and experience as much of Ocho Rios as possible, not just the tourist traps and all-inclusives. 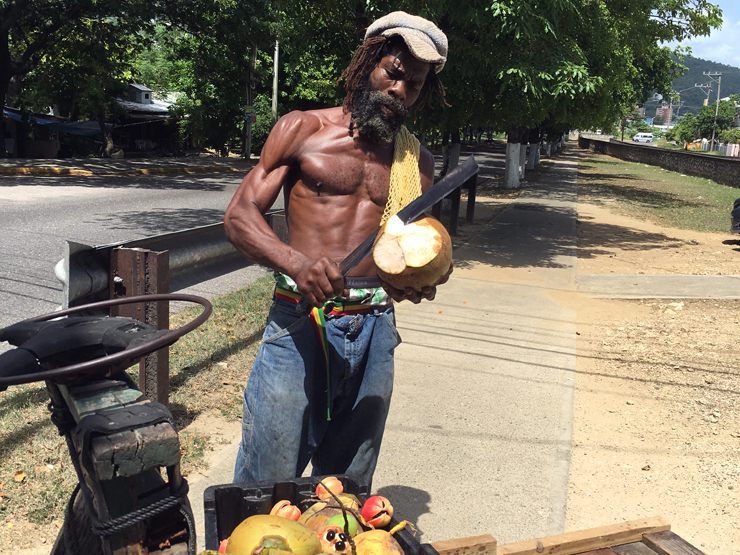 We also wanted to get an insight into the “Real Jamaica”. However our first stop had taken much longer than anticipated; we just couldn’t tear ourselves away from Island Gully Falls. I wasn’t sure how we would still accomplish our goal today since we were already so far behind schedule. We had been picked up that morning from our hotel in Ocho Rios by Javia from Know Jamaica Tours in a spacious air-conditioned car. Ravenous from our international flight the day before, Javia took us straight to ‘the best breakfast place in town.’ Tropical Kitchen on Ocho Rios Main Street, which did not disappoint. From the outside it looked quite unremarkable and could easily be missed. However the amount of locals queuing inside was a sure sign that we were on to a winner. They served various pastries or ‘hot pockets’ with delicious fillings and a selection of freshly baked cakes. I just wish that we’d have purchased more. 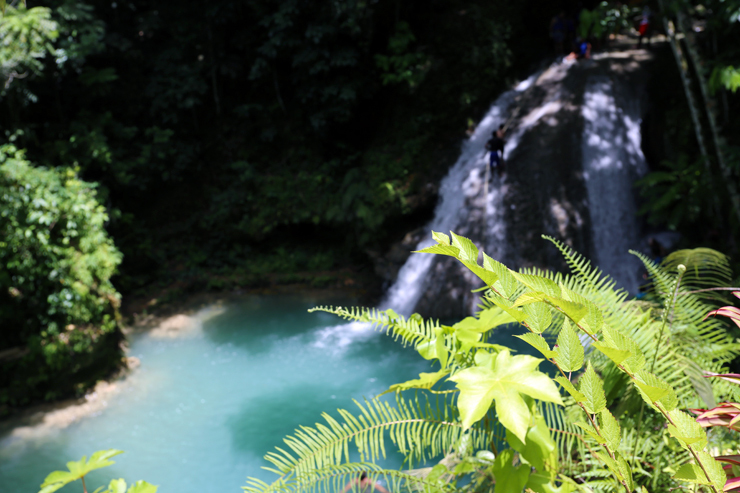 Next was the breath taking Island Gully Falls, also known as the Blue Hole. It was quite a rocky road to get there. 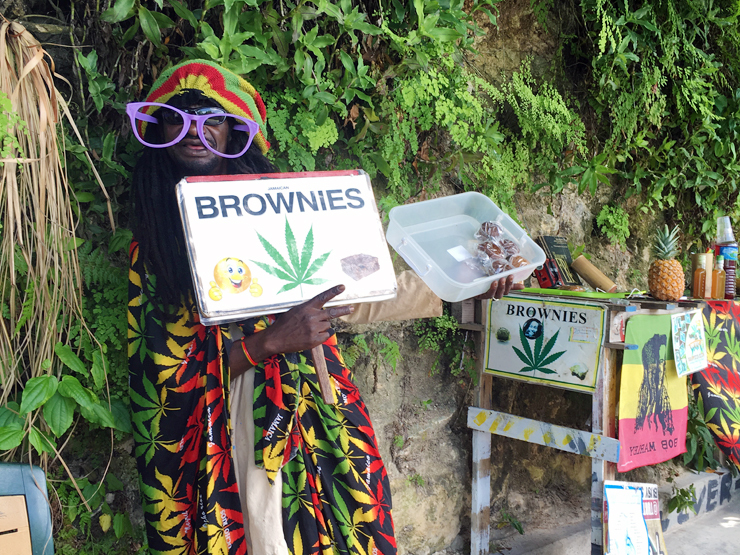 This was the perfect introduction to the beauty of Ocho Rios. We spent the morning leaping into deep turquoise pools, rappelling down waterfalls and swinging off ropes. Our private guide Jason made sure we felt safe at every moment, his motto “you’ll never fall if you’re with me.” There weren’t many people there when we arrived which made the experience even more special. No wonder we were late back to meet Javier. Hungry again, we stopped to get some snacks before heading to the White River, where we met ‘Dread Bob’ who calls himself the living Bob Marley. His beard dread is longer than I am tall, and older than me too. 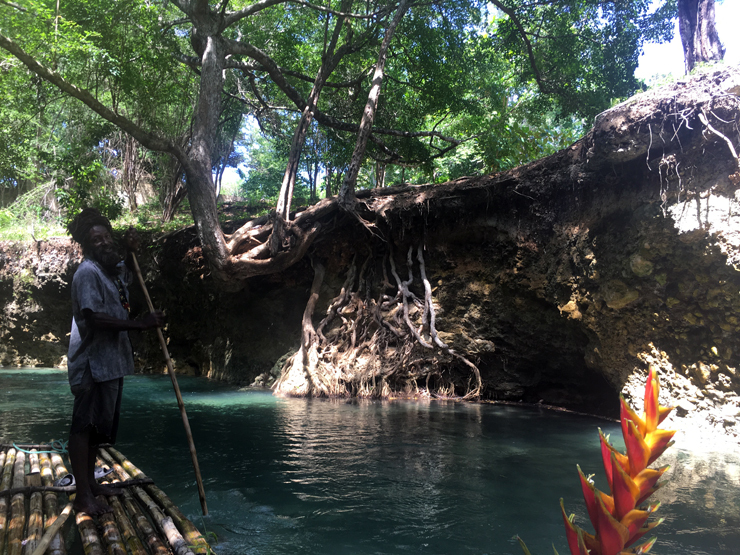 Sat atop his rustic bamboo raft we floated down the river, stopping to admire the native flowers and listening to him serenading us Bob Marley style. Later we encountered a swing hanging above the water and stopped at the riverside bar. We got to see the other side of the river, past the fishing boats and out towards the sea, where we met some of the locals relaxing there. There is also a nudist beach just a little further along, if that floats your boat. We started at the beach, all holding hands in a chain and proceeded to climb up the cascades one level at a time. It was a fun experience, and again, so pretty. I just wish that we would have had time to stop and swim in the various pools instead of pressing on. When you reach the top there is a large sign to congratulate you on climbing the world famous Dunn’s River Falls. We made it! 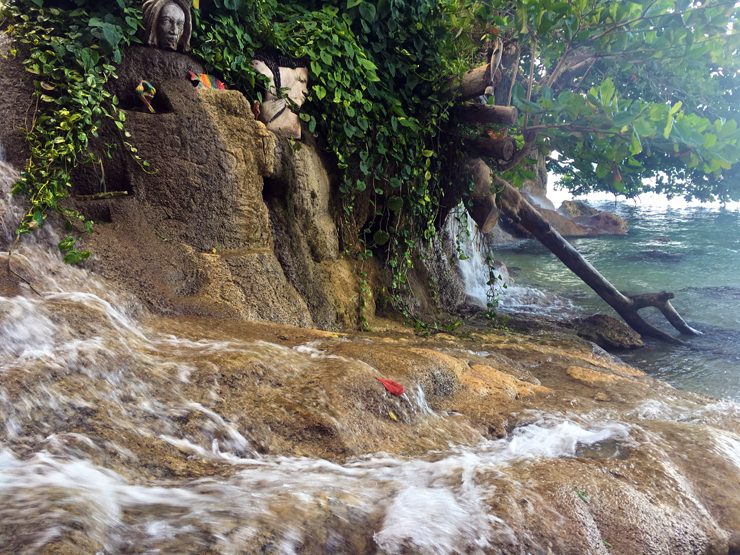 After returning to the car, almost waterfall-ed out, we made a quick stop at one of Javier’s favourite spots in Ocho Rios. 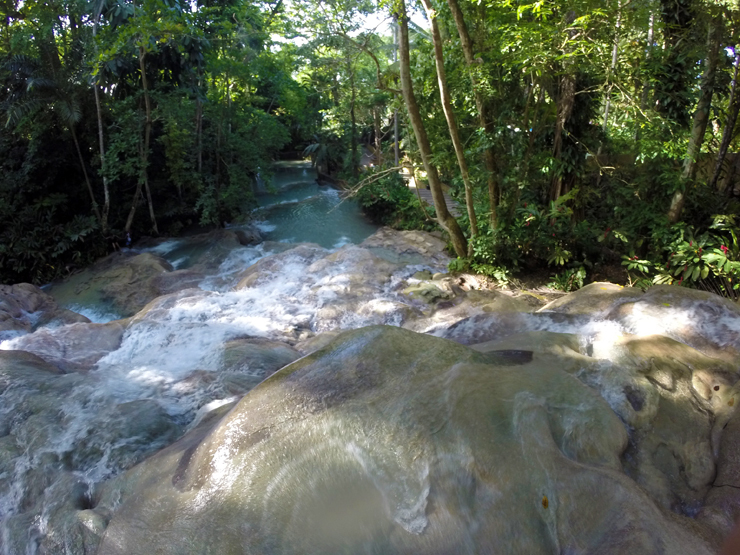 The “Secret Falls” or Little Dunn’s River. Here it was free to enter and Javier arranged a guide. It was clear, as soon as you climbed through a small hole in the fence that this was somewhere for the locals. The vibe was instantly different, although there were vendors there, they didn’t really take much notice of us. There was reggae music playing, and people just relaxing, enjoying the views and swaying to the beat. We climbed down to the beach where the water was cool, and we shared the views with only one other couple. There was a cool rock formation that looked like the face of a Rasta from a certain angle. 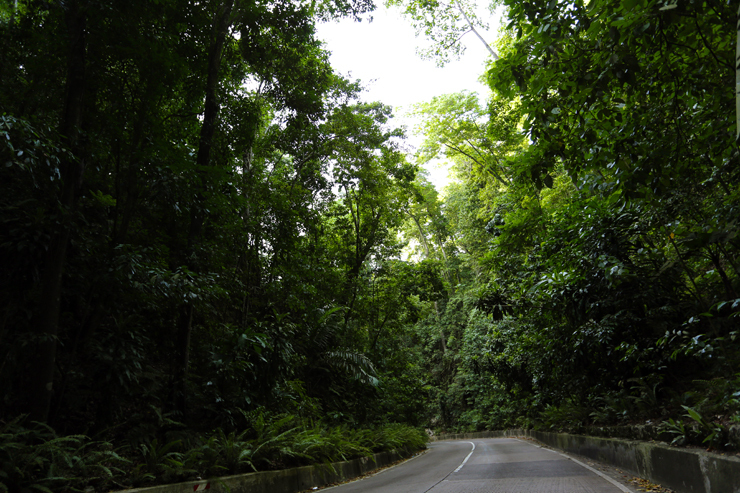 Just before we went for dinner, we drove through a magical place; Fern Gully. It was probably more magical for me because I was so enamoured with a film of the same name (but not related) as a child. This Fern Gully, established in 1907 is home to over 500 varieties of ferns. Originally a river that was destroyed in an earthquake, the riverbed was paved to make a very scenic three mile road through a tunnel of green towering ferns that dappled the sun’s rays. 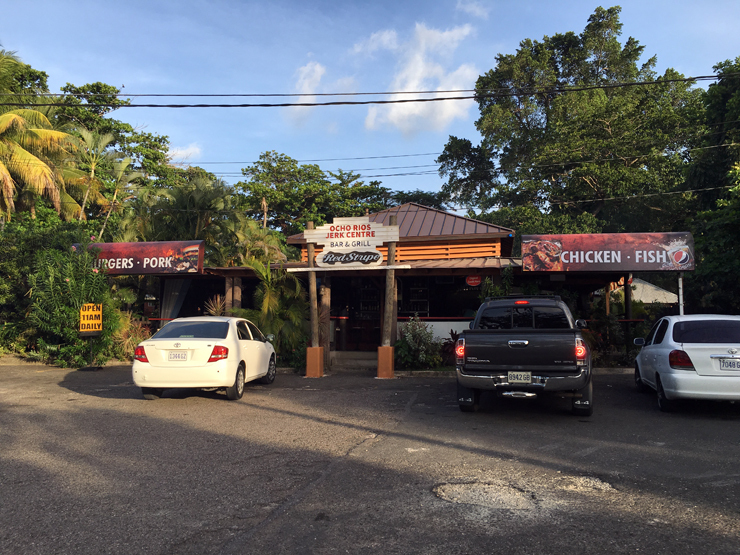 Finally we descended up on the Ocho Rios Jerk Centre for some legendary jerk chicken, pork and festivals (our new favourite side dish!). The menu had everything you would expect and there were plenty of cocktails to choose from. 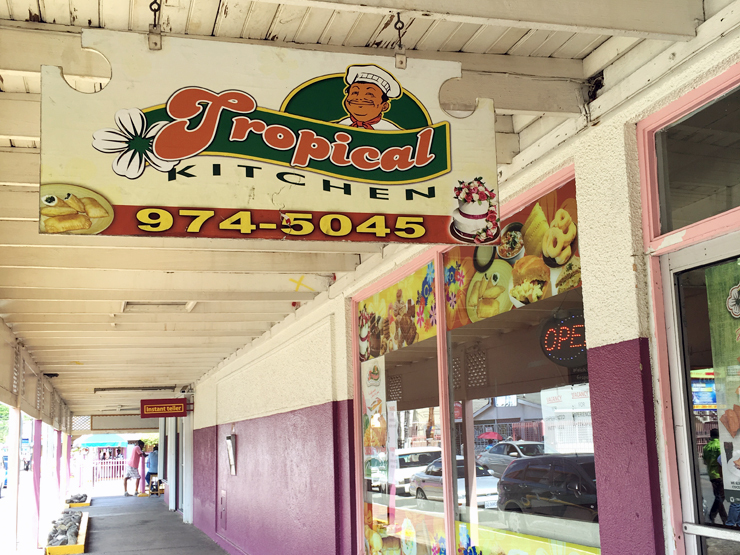 The Rum Punch and Pina Coladas were a great treat, and very strong. Perfect for the end of the day. We felt safe with Javia at all times and he had such great local knowledge and passion having grown up in the area and attending the local high school. They are specifically set up to accommodate bespoke tours for small groups or couples who want to get to know the real Jamaica from a local guide and the day is all about you. We were immersed in the ‘real’ Ocho Rhios and felt like we made the most of our short time there. Sadly smaller businesses here don’t benefit from the mainstream tourists visitors from the cruise ships. Going with Know Jamaica Tours, a small family owned company, not only supported the local community, but also meant we had more flexibility and there was more attention to detail. Everything was organised before we arrived and even by my standards we managed to pack in a lot as he was so eager for us to see his local culture. Huge thanks to Javia and Marva from Know Jamaica Tours for organising everything and sponsoring our day. However we had a fantastic time and as always our options are honest and our own. If you would like to get in touch for some local advice or to book a trip, they can be reached at knowjam@gmail.com or +18763509770. 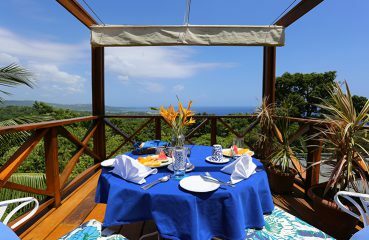 Everything about your visit to Ocho Rios looks phenomenal! I visited Negril in 2011, but we barely left our resort. It was a week long vacation and we were too exhausted to do much adventuring. 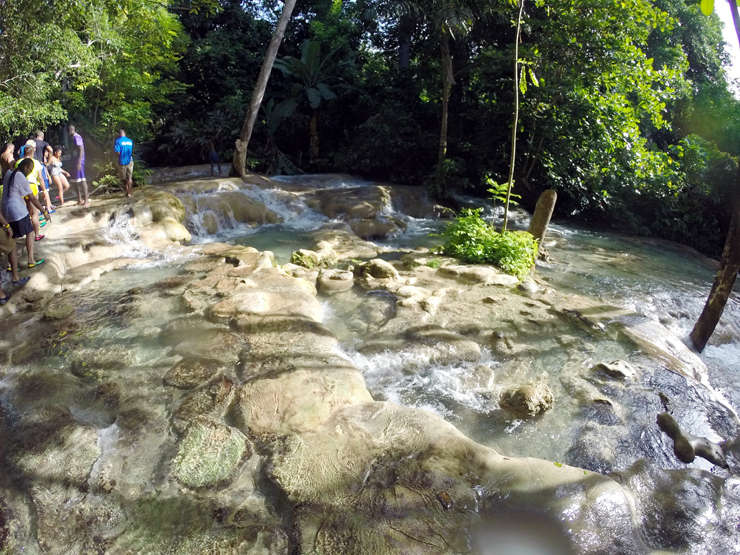 When we return to Jamaica, I definitely want to visit all of these falls! 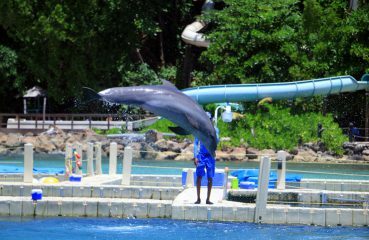 I love Ocho Rios, it was one of the highlights of my honeymoon! Being of Jamaican decent, I just realized that I have not done one tour in Jamaica! Next time I go back, I think I should travel as a tourist. Looks like you had a fun day out. Jamaica is high on my bucket list. Oh and the Brownie HQ – Hilarious. Did you happen to try any of the #brownies? I haven’t been to Ochos Rios but maybe some day soon. I hear it is beautiful just haven’t had a high desire to run there right away. Hi Ellie, That’s awesome! 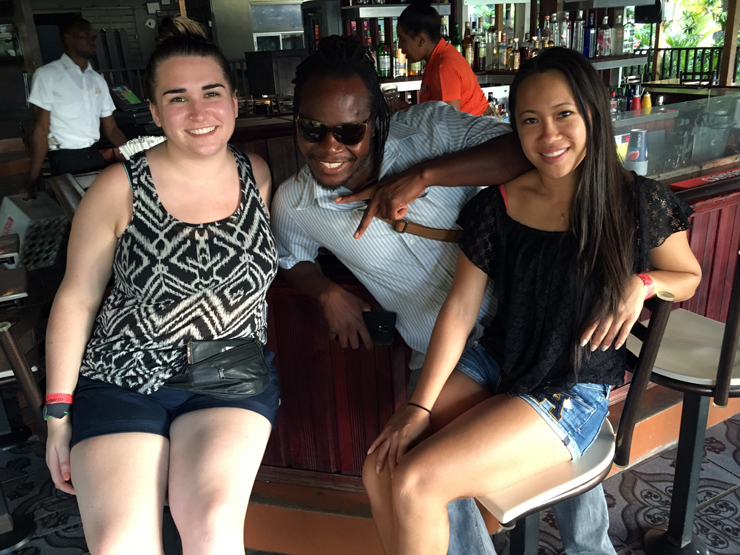 We absolutely loved our day in Ocho Rios! How was the Nine Mile tour?